Fintona is a single storey timber house and, formerly, a doctor's surgery located at the north-west corner of Gage and Church Streets, 4 blocks south of the centre of Coleraine. It was constructed in 1893 for Dr Samuel Connor who had recently immigrated from Ireland. The house is typical of the period and situation, being symmetrical about the front door and modest in its detailing. It appears to have been designed by the local civil engineer, Arthur Hill. The corbelled chimneys are of interest. The original fence and remnants of the garden survive. The original timber coach house, stables and loft survive in the north-west corner of the site. Fintona was of the home and surgery of several doctors. The house has been converted into three flats, which has compromised its integrity. The property is in fair condition. 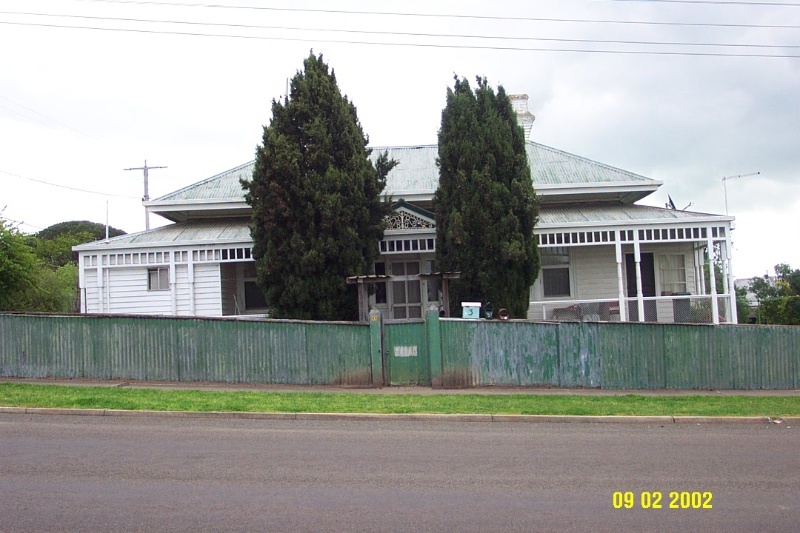 The residence and former doctor's surgery known as Fintona are of architectural and historical significance to the township of Coleraine and the Southern Grampians Shire. Fintona is of architectural significance as one of a small number of substantial architect designed late 19th century timber residences in Coleraine. Historically it is significant as the home and surgery of several local doctors. Fintona is a typical late Victorian style residence constructed in 1893 of timber weatherboards with a corrugated iron roof. Its design is symmetrical, with a central doorway flanked by single-paned double-hung sash windows on each side. The timber verandah, which encircles the house, has a pediment with decorative cast iron marking the front door. The simple turned timber posts are paired and there is simple timber fretwork. Sections of the verandah have been enclosed with weatherboard to create service areas and the north side has large recycled window sashes used as infill. A pair of tall corbelled chimneys are symmetrically positioned. The original framed corrugated iron fence survives with large timber posts and one picket gate. Two large Italian Cypress (Cupressus sempervirens) mark the front gate. There is a Prunus shirotae in the south-east corner of the of the garden beside a subsidiary pedestrian gate. There is a very large Almond (Prunus duclis) beside the surviving coach house, stables and loft above located towards the north-west corner of the site. A more modern garage with extensions has been built in front. The condition of the main house is fair. The condition of the boundary fences is poor but with a good degree of integrity. The condition of the coach house, stables and loft is poor but with a good degree of integrity. Integrity of the house has been compromised by its conversion to flats. Other wise the grounds and the coach house, stables and loft are substantially intact.